The Belcourt theatre’s annual Second Saturday Outdoor Cinema is upon us once again. Every second Saturday throughout the months of June through September, the Belcourt sets up a projector in the parking lot at sunset and screens a film on the walls of the theatre itself.. All Second Saturday Outdoor Cinema screenings throughout the summer are free and open to the public. Nashville residents bring chairs, blankets, snacks and enjoy the evening temperature and the fun atmosphere of Hillsboro Village while they watch a movie outdoors. This summer long program gets kicked off this Saturday, June 11 with The Blues Brothers. See below for the dates and times of all the movies screening at the Second Saturday Outdoor Cinema. Directed by John Landis in 1980, The Blues Brothers is a classic road trip comedy and stars John Belushi and Dan Aykroyd as Jake & Elwood Blues as the go out on their “mission from God’ through various shenanigans and mishaps. The film also has cameos from such blues legends as Ray Charles, James Brown and Aretha Franklin. It will be a great experience watching this film outdoors with others. Destry Rides Again is a 1939 Western directed by George Marshall, who directed “The Railroad” segment of How the West Was Won. Jimmy Stewart and Marlene Dietrich star in this Western about an unlawful town controlled by a corrupt mayor and saloon owner. Directed by John Badham in 1983, Wargames stars Matthew Broderick as a hacker that accidentally sets off a nuclear war scare when he hacks into a government war simulation. The film also stars fellow 80’s regulars, Ally Sheedy and John Wood. Check out FilmNerds front-man Matt Scalici’s great write-up of Wargames. Psycho was directed by Alfred Hitchcock in 1960 and is one of the greatest films ever made. If you see only one Second Saturday Outdoor Cinema film this year, make sure this is the one. The Nashville September weather coupled with the fantastic audience involvement will create a terrific atmosphere in which to watch this film. 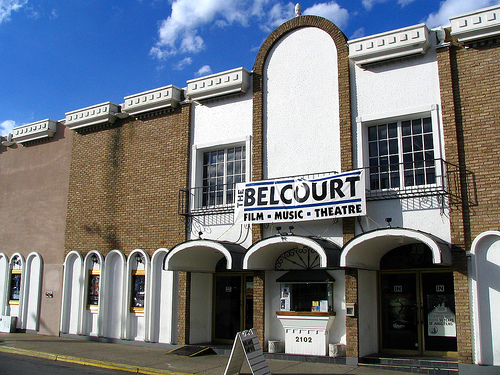 Come to the Belcourt theatre every second Saturday just before sunset and enjoy these rare film experiences. Afterwards, stick around and enjoy the great night life in Hillsboro Village.